Last week I showed you how my example blogger friend manages his blogging and life using Kanban. How do you do this yourself based on last week example? Why are you writing your blog? For fun? To put your thoughts down on virtual paper? To gain a reputation as the best carpenter in the neighbourhood? The reason isn’t important. What is important is that you know what the reason is. Our blogger from last week uses the blog as a means to an end. He wants to enhance his professional reputation, and get invited to lecture on his subject. 1. We need to publish a post once or even twice a week. 2. We need to find time to write and post to the blog without losing our day job. 3. What happens when you go on a three week vacation? Does someone else update your blog? 4. Do we need to factor in peer review times? 5. We need to track our reading rates and statistics. 6. We need to distribute the blog posts through online channels. 7. We want to be able to answer reader questions and post requests. 8. We want to add more blogs in the future. BTW :brainstorming can be an amazing tool to understand our need. Starting off using Kanban to manage your flow may be hard at the beginning, but in few weeks you’ll get the hang of it. Step 3: Based on your needs , go and Visualize your flow. This is a crucial step. Visibility is a powerful aid to getting things done. Remember, the flow we build in the beginning can change - in fact, it HAS to change, as our needs change or our view of our actual performance changes. When we think ‘effective and ongoing improvement’, we change things. So put on your blogger hat, and Map the steps you do when writing and publishing a post. Once you’ve put down this basic flow, ask yourself what you’ve forgotten. Go over all the steps. But - Don’t forget to keep it simple! This flow shows the step by step path a blogger takes from a concept to a finalised blog post. So where do we visualize the flow ? 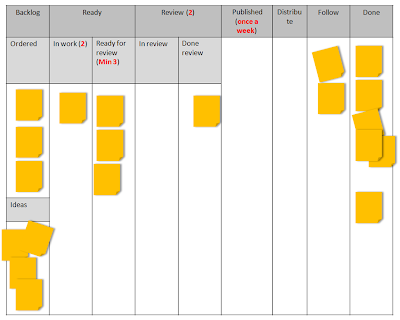 Set a Task Flow board. Usually I would recommend a white board and some sticky notes . This time. 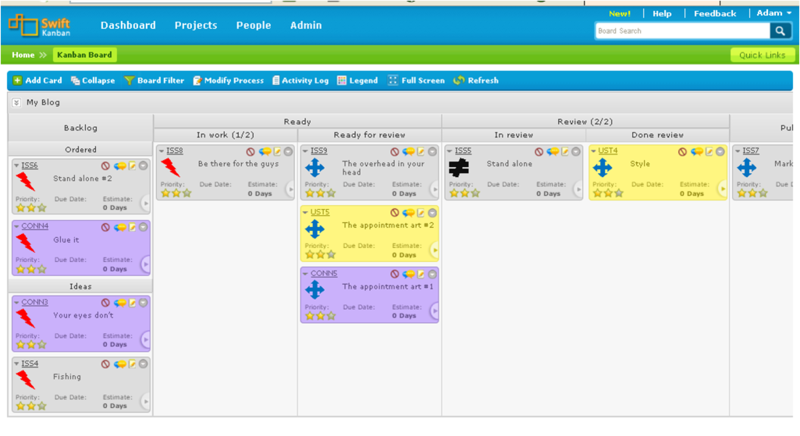 I’d like to show you the flow using a software tool. As we have to write documents and move ideas , pics and documents around, it’s so much easier to use software. 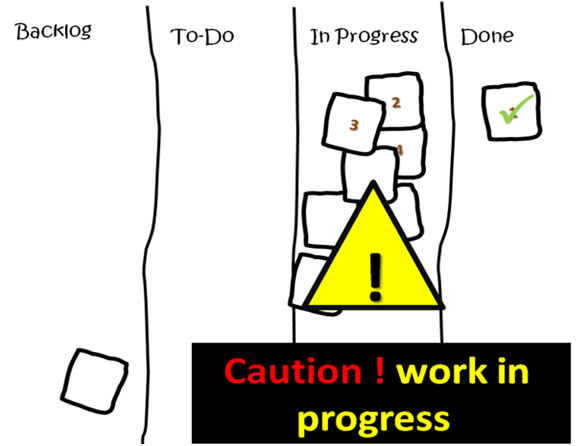 Each post will be a card moving on this board columns according to its actual state. Start working and move posts around the board. look at your flow and ask yourself does it mach your needs? does it fit your vision ? It means , understand your limits, and follow them. When we acceded the number of tasks/ work we can handle , we end out doing nothing valuable. in fact , we end investing more effort then expected. We need to Focus on the important & Challenges . This way, instead of dealing with things that aren’t getting done, we focus on what’s really important, and have time to learn new skills. Keep in mind, that in some steps of your work you want to limit yourself from getting overloaded or with mach more tasks that you can handle. Limiting yourself prevents you from overloading, and getting stuck with a lot of unfinished writing that cannot be published. First, Work in small chunks. It means , you don’t have to have an idea and then elaborate it fully to 3000 words and all in one time. 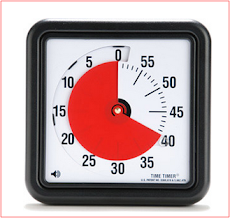 As our blogger did, work on small slices of time every day. Take small chunks of time and invest them in small flow steps every day. After all, you also want to be with your family, and you’ve got your job to think about. Doing some research for half an hour every night is a good start. In fact, the flow reflects this need to work in small chunks. We have a chunk for ideas, then a chunk to elaborate on them, then a chunk to review, and so on. Don’t limit the backlog. Got an idea? Stick it here. This one is a bit tricky. The limit is for the minimum, not the maximum number of ready posts. It’s best not to count on having just one post ready to go. Make sure you have enough posts ready to keep the flow moving. So having 3 posts ready at any given time, is the policy for this column. For our blogger the maximum number of posts ready for review is two They can’t do anymore. Once a week. This limit is a time constraint. You can change it, but you don’t want to inundate your audience. Two days after publication. This is a policy and limitation we need to keep in our blogger world. This column starts day after the publication and is followed for a week . We need to know that we track each post, so that we can improve on them in the future. Set up your rules and guidelines of your work Understand your needs and make sure to follow the rules. the policies will define when and why a ticket is move from one column to another. write them down .Change the rules when reality changes. Make sure to prepare your peer for the next blog and priority. What is the best time to write your post? During the weekend? The evening? When is the best time to review it? Moving forward from task to task without looking into your performance will bring little or no improvement. We want to avoid doing the same mistakes over and over again. We want to be efficient. For example, if you find yourself correcting post after post, after they are reviewed, ask yourself how can you do it better. Maybe you’re just using the wrong file format. So change your formatting from now on. Improving is a key. Take a look at your performance. Are you satisfied with the results? Try to improve and change accordingly. don't be afraid to change , try and learn from the change (PDCA). We may need to change our flow or policies, our audience or reviewers. What brings better results? This is a process done all the time. Our blogger wants to have a size of that’s that he can handle throe the process steps easily. Measure your ability to write – 600-1600 words in a week. Is it small enough? Or should your posts be smaller. Can the average reader read 3,000 words? Isn't it too big? Do we need to change the flow as a result? Can you keep on posting a blog once a week as you need to? If not, what is holding you back? 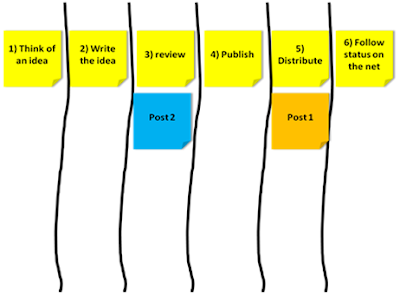 What are the relevant changes in the flow you want to add so you will be able to keep publishing a post every once a week? We can measure the cycle time of writing a blog. That means, from when you start elaborating an idea (a) to the time it is distributed (b). Now, is the cycle important? The answer is probably yes. Lets say that you are approached by an author, who wants you to review his book. Knowing the length of your cycle means that you can give an estimation as to how long the post will take. Will it be published in two weeks? Four? The main principle is - Improve. Know your field and improve. How many visitors come and read your blog? What type of blog brought the most visitors? Does your flow as it is have an impact over this data? **The tool chosen for this presentation is swift Kanban, it has a free interface easy to use and professionally fit to our blogging needs.